EXOPC have released a video to demonstrate the EXOdesk. The device is a tabletop computer slate that provides a 40-inch touch sensitive display. More details will be available at CES2012 and other news sites are reporting a price of $1299. Red or Black is a new 'quiz show' on UK TV - Ok, I reluctantly admit to watching this program on Sunday, but it became more interesting when I happened to notice that the stage set for Pixie Lott was using 3D holographic images produced using the Musion Eyeliner system. Musion Eyeliner is a high definition holographic video projection system for producing 3D moving images within a live stage setting and can be used for various live events, including audiovisual artistic performances, conference or trade show presentations, retail displays and large-scale digital signage. The system seems to be very effective, although it may be different when seen for real. In the past, the system, has been used by the Black Eyed Peas at the NRJ Music Awards in 2011 where 2 of the performers are holographic. You can see a video of their performance on Vimeo. Black Eyed Peas Hologram - Live at the NRJ Music Awards 2011 - Musion from Dimensional Studios on Vimeo. Vuzix manufacture a range of Video Eye-wear and personal display devices for mobile video, entertainment, defence and commercial markets. The concept of using glasses/goggles with an embedded video display to watch TV or play video games isn't a new idea, but my interest was re-ignited when I noticed their augmented reality eye-wear the Wrap 920AR. These provide the equivalent of a 67-inch display as seen from 10-feet away. 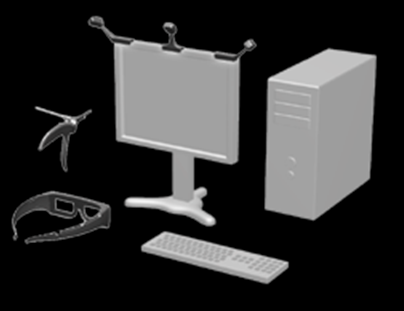 A stereo camera pair enables the mixing of the real world with a virtual world. Each camera capture 752×480 images at 60fps to enable a 1504×480 side-by-side image that can be viewed in 3D Sterescopic video on the eye-wear displays. It will be interesting to see how this technology can be used. I thought I'd already written about this but cannot find a reference to it anywhere. Bonfire is a project that uses 2 micro projectors to project an interactive display image on either side of a laptop keyboard. Cameras are used to enable hand gesture tracking and object recognition within the projected display area.